The New Improved GLOCK Pro-Sights® will fit ALL Glock Pistols EXCEPT for SINGLE STACK MAG guns like the G42/G43 Small Frame Models. SPECS: Fits ALL Model Glocks except G42 & G43 with NO FITTING REQ'D. Rear Notch is .140" wide by .090" deep. 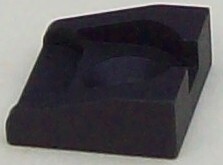 Designed for use with almost ANY 1/4" high front sight. Rear Notch is .140" wide by .090" deep. 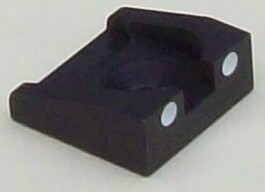 Designed for use with most ANY 1/4" high front sight. SPECS: Fits ALL Model Glocks except G42 & G43 with NO FIling REQ'D on dovetail or front sight oval. 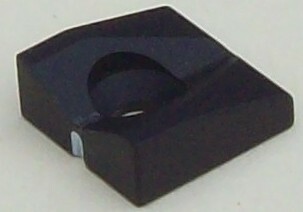 This Rear Sight Base made from Heat Treated 4140 Chrome Moly Steel. 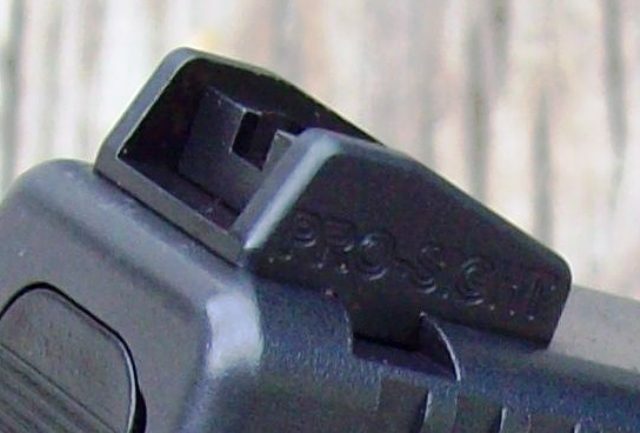 The Rear Sight Blade is made from Black Delrin (so it won't rust, it won't show holster wear, and it is ALWAYS FLAT BLACK EVEN IN BRIGHT SUNLIGHT! ! ! ). This is the most rugged Fiber Optic front sight on the market. The Fiber Optic insert is cradled deep in the sight and guaranteed not to break or shoot loose. It has an improved serrated ramp face and rounded top design so it won’t hang up on holsters or clothing. The sight attaches to the slide via a hold down screw from underneath (Note: Our Front Sight Screw is the strongest made). This sight is CNC machined from solid steel and MADE IN THE USA. Fits ALL model Glocks EXCEPT G43 & G43. SPECS: Front sight is .250" HIGH; .125" WIDE with a 2MM DIA DOT. It has the STRONGEST Hold Down Screw Made from Heat Treated Stainless Steel. 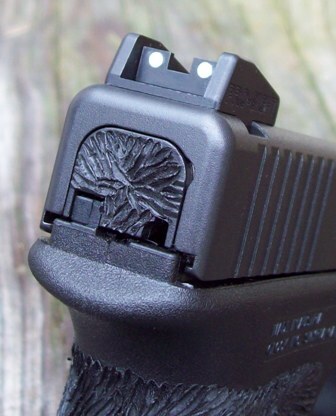 This is the most rugged Front Sight on the market. The sight attaches to the slide via a hold down screw from underneath (Note: Our Front Sight Screw is the strongest made). This sight is CNC machined from solid steel and MADE IN THE USA. Fits ALL model Glocks EXCEPT G43 & G43.